Why Does My Screen Go Black When My System is Out of RAM? - Ask Leo! Why Does My Screen Go Black When My System is Out of RAM? If your monitor suddenly goes black due to being out of RAM, it's likely your computer has crashed. My computer screen goes black when my system runs out of RAM. The only thing I can do is reboot. Is there a way around that? I’ll review the causes, and what steps you might need to take. There are many reasons your screen can turn off or go black. 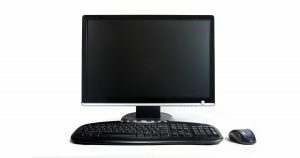 It could be due to a screen saver; a cable could have become disconnected; or the monitor could have been turned off. Since you’ve associated this with your computer having exhausted all available RAM, none of those are particularly likely. It’s much more likely your computer has simply crashed. That means Windows is no longer running, your applications are no longer running, and the CPU is probably in some confused state it can’t get itself out of. Rebooting is your only option. Windows does everything it can to try to manage memory quickly and effectively. Generally, it tries to warn you when available RAM is running low. Usually prior to that happening, your system’s performance will suffer — often greatly — as Windows attempts to compensate for the lack of available RAM by using virtual memory (VM). Virtual memory is simply disk space set aside to be used as if it were RAM. Disks are significantly slower than RAM, and as a result, the system can become excessively sluggish. There’s also a limit to how much VM Windows will use. When both RAM and VM have been exhausted, your system is truly and completely out of memory, and will likely crash, spontaneously reboot, or come to some other kind of halt. Particularly when resources are that low — being completely of out of memory — the crash can look like the screen going black. Windows doesn’t have the resources it needs to run and can’t update the screen any more. The solution, of course, is not to let your system get into a situation where it runs completely out of RAM. That also requires at least a guess as to why it’s running out to begin with. Add more RAM, if your system supports it. Don’t run so many programs at the same time. Exactly how much RAM is enough, and how many programs is “too many”, depends on what you’re trying to do and the needs of the programs. If a program you’re running is causing the problem, the tactics above only postpone the problem, at best. It is possible for software to simply manage memory poorly. That means the application keeps on asking for more and more RAM until the system runs out. This is referred to as a “memory leak”. Depending on the application, memory leaks can be quick — the problems associated with the leak become apparently very quickly — or slow, meaning the leak is so insignificant you never notice it. If you are running a poorly written application that manages memory poorly, there’s little to be done. If this happens repeatedly, monitor what programs are using RAM, see who’s using it up, and if you detect a consistent repeat-offender, reach out to the software vendor for a fix. I got a blue screen error, what should I do? - Blue screen errors are less common than they used to be, but they can still happen for a variety of reasons. I'll review what to do, and when. « Previous post: What kind of computer you get depends on your needs and your budget. One more reason could be that computer was never shutdown or restart and due to the memory leak OS running out of memory. I generally find that my computer works best if it has a restart every day, even though I don’t think I’ve got a memory leak. “Monitor what programs are using RAM.” I find that Firefox sometimes seems to be running away with RAM, even if it’s just sitting on a page (no audio/video playing). Is that Firefox, or is that a poorly constructed webpage? 1. Identify the offending program/application/app/whateversoftwareiscalledtoday. 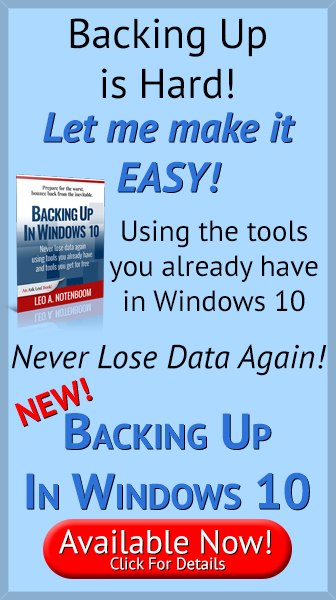 Windows usually cleans up all memory allocated for an instance of software – including ‘leaked’ memory – when you terminate it, thus making the memory available for other uses. It is probably possible to automate the terminate-and-restart process, but the first step is to identify any possibly offending software and be sure a terminate-and-restart really fixes your issue. and got Your 404 page. I saw an extra _ between the words “Programs” and “Use” in Firefox’s Status Bar when I hover the mouse over that Link. A Link to that same page works O.K. on another page on Ask Leo. Thanks for Help us, I’ve learned LOTS reading pages on Ask Leo. 73 de MoreOff . .